Market volatility is the measure of the price fluctuation in the market. The higher the volatility, the more will be the fluctuations in prices, not only in terms of frequency, but also in terms of difference. A low volatility means a stable and consistent market. Vipul is a newbie in stock market trading and is still learning the nitty-gritties from his elder brother Vijay. When Vijay was teaching Vipul how to choose stocks for day-trading, he explained that volatility plays a key role. One day, Vipul asked his elder brother about volatility and how he can measure it? This is how Vijay explained volatility, its key measures and impact. If you too want to understand volatility and its key measures, then here are some important points. Standard Deviation: Standard Deviation is often denoted by a delta. It is the primary measure of volatility used by analysts and traders. It depicts the average amount by which the price of a stock has differed from its mean value over a given period of time. To calculate Standard Deviation, first, you need to calculate the mean value of the price and variance. The higher the value of standard deviation, the higher the volatility. Simple Moving Average (SMA): Simple Moving Average is the average value over a period of time. It helps in understanding the trend. Simple Moving Average is the sum of the closing prices for the number of periods divided by the total number of time periods. Bollinger Bands: Bollinger Bands uses deviation in the Simple Moving Average of 21 days, to measure volatility. An upper and lower band is placed at the standard deviations above and below the SMA. The higher the gap between the two bands, the higher is the market volatility, while a narrow gap between the bands signifies lower market volatility. Average True Range (ATR): Average True Range, commonly termed as ATR, is considered a more accurate measure of daily volatility. To calculate ATR, you should first calculate True Value (TR). True range is the highest of the above three values. ATR is the 14 days Exponential Moving Average (EMA) of the True Range calculated through above equations. A high ATR signifies a higher volatility and a low ATR depicts a lower volatility. Volatility Index (VIX): Volatility Index, commonly termed as VIX, is a measure of volatility, which focuses more towards the market sentiment. It is mainly used for deciding the market hedging strategy. VIX is used mainly for the derivative market. A high value of VIX means higher volatility and significant changes, while a low value of VIX means a lower volatility. 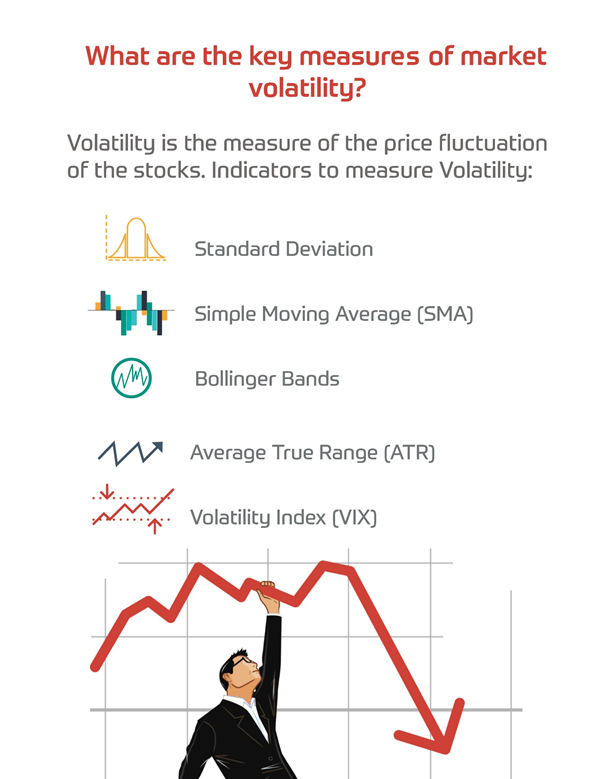 With this information, you too can calculate market volatility and trade accordingly. A very high volatility means higher risk. For trading, you should look for medium volatility in order to limit risk as Vijay suggested to Vipul.